8.0 oz 50% cotton, 50% polyester NuBlend preshrunk fleece. Generous fit. Perfect for the colder seasons, great for all occasions. Durable, long-lasting, and super comfortable. 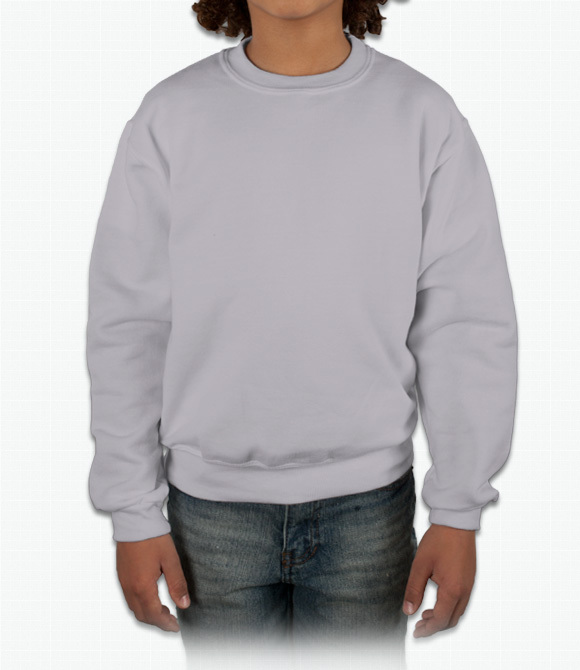 "I ordered the sweat shirt with the fleece lining and it is really nice. The only thing I might suggest is that you put the size i.e. Size M (10-12) because some sweat shirts are cut smaller. This sweat shirt appears to be true to size. I made the mistake of ordering a size L which I thought might be cut small becauseof the low cost and consequently it was too large. However, artwork was so well done I ordered a second one in a size M (10-12) after checking with customer service on the size wihch I should have done first. Maybe you can add the size beside the S, M, and L."
"Family members comment on how soft and comfortable it is. . I can tell it's a cheaper blank -- I'm glad they can't tell." "While the small is the right size, the shirt itself is a little shorter than the Small sizes available in stores. Could be longer. But service was great."